I've missed sharing my reading life for most of November on this blog, so it's fitting I finally post again on the last day of the month. My reading in November has been lots of "parts" of books - mostly professional - as I decide whether I have an idea I want to write about or not. I have read several picture books in the last week, but for today I decided to concentrate on what I read this week. It was a good reading week. I challenged my students to really read over break and I pledged to read a book a day. 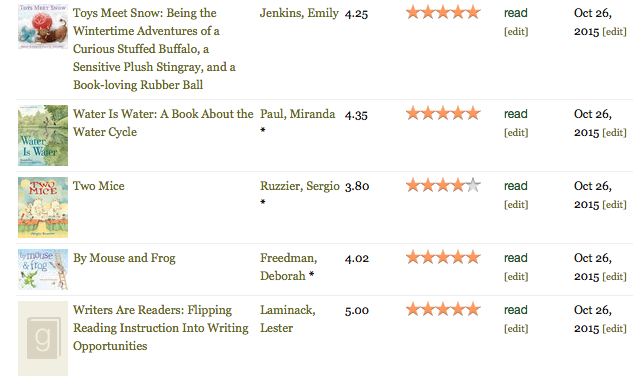 This wasn't exactly a hardship, I had so many ARCs from NCTE I wanted to read and pass on to them. The majority of the advanced copies had gone in my classroom before break. I'll read them when the students aren't. But these, these I needed to read. Lucy & Andy Neanderthal is a graphic novel from Jeffrey Brown, who created Jedi Academy. Here he follows the story of two neanderthals and at the end of each chapter are two scientist from the present explaining what life was like for them. My kids will love it. The Wild Robot from Peter Brown is his first middle grade book, I believe. My students love him from Mr. Tiger Goes Wild and My Teacher is a Monster. They will devour this story about a robot, Roz, who ends up on this island and finds her way. I wasn't sure that I'd connect with a robot, but I loved her by the end. (Heck, by the first thirty pages.) I'm praying this is a series because it sure seemed so at the end. I foolishly posted a photo of Booked on Instagram and instantly had comments and messages from current and former students begging for the book. Kwame Alexander has done it again. This is not a continuation to The Crossover, but a stand alone book about a twelve year old named Nick who is dealing with a bully, his parents' separation, and a crush - all things my students can relate to. Nick is also a soccer player. I loved this book. Hook's Revenge was a book I started before NCTE, but had to wait until the end of the conference to return to. Captain Hook's daughter, Jocelyn, is out to tackle that famous crocodile and get revenge for her dad. Kids will love this series. Pax, oh boy. This book will tear you up, but then leave you wanting more. Peter found a fox kit five years ago. He raised him and named him Pax. Now Peter's father has to join the army to fight the war that is invading their home. He tells Peter it is time to return Pax to the wild. Peter does, but then immediately regrets it. Then, the adventure begins. Pax is told in alternating chapters of Peter and Pax's story. Amazing. And, Dead Boy. I have a review up of this one on my blog for Friday. It's a good one. Well, that was an unplanned break! I hadn't planned on taking two weeks off, but during the NCTE/ Thanksgiving season, these things happen. That makes me especially grateful to join Ruth Ayres and her celebration community today. You can find Ruth's blog and more celebrations linked up HERE. My friend, Donalyn, calls NCTE "plaque removal." Many friends remarked that they wouldn't be teaching anymore without this conference. I think both comments are a testament to the power of this conference. I travel to NCTE and am immediately surrounded by friends who are as passionate about teaching as me. I am beyond grateful for a district and husband who support me attending this conference each year. What a blessing it is to listen to so many presenters and friends inspire me and want me to return to the classroom that minute and teach? A powerful experience. A photo for my students with Melissa. Our classes have connected this year from Maine to Illinois. I love that so many authors attend NCTE. I imagine writing to be a lonely job at times. Being able to share the impact their writing has had on my students (and myself) is important to me. To me, authors are part of a partnership with teachers and librarians. We work together to hook children into reading. Getting to know authors, hearing their stories, gives me an added conversation to share with students. I was grateful to celebrate books, authors, illustrators, and publishers with my students when I returned from NCTE. We did some "speed dating" with many of the ARCs I brought back. To see the excitement in the room while the kids previewed books was exhilarating. My students are crazy over Phil Bildner's A Whole New Ballgame. I've long been a member of the Nerdy Book Club, even before there was a club. I think anyone who grew up as I did with an addiction to books was too. 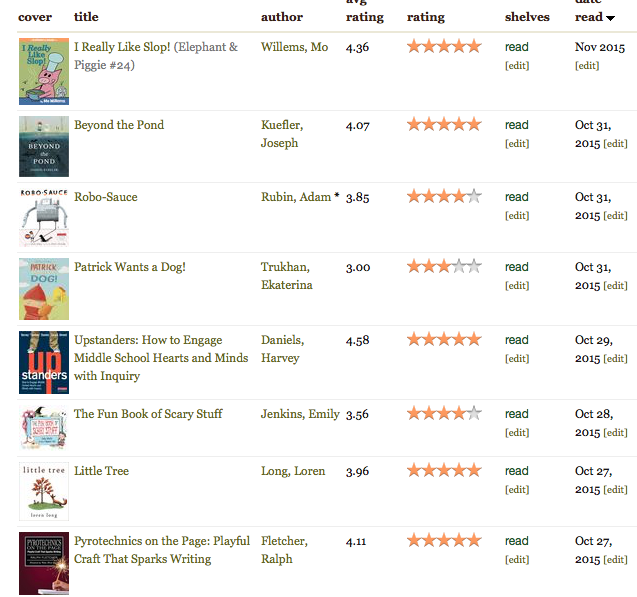 I love that Donalyn Miller and Colby Sharp took this concept of loving books and created a blog. Along with those two and Cindy Minnich, I now help run that blog by scheduling posts. It is a great resource. But NCTE each year reminds me that Nerdy is more than a blog, it is this entire community that we are a part of. Presenting with the Nerdy panel this year was powerful. My students know that presenting stresses me out, but this one didn't. I felt good about it. Attending the Nerdy party on Saturday made me smile. All of these teachers, authors, illustrators, publishers, etc gathered together - what an amazing community! Long live Nerdy! Our fabulous Nerdy Book Club panel for NCTE. Man alive, my students rock. I've known this, of course, but traveling away from them reinforced it. I created a Padlet for them to comment on, if they wanted, when I was gone. For my part, I promised to add photos. Many had never been on a plane, so I said I'd take a photo out of the window. I also promised I'd take a photo with some authors for them and post them there. I had no idea that it would be my students posting comment to me that would move me to tears. They knew that flying and presenting made me nervous and felt compelled to write me notes. Such cool kids. I think I will set up a Padlet for us to communicate over Christmas break as well. It was an awesome experience. NCTE takes me away from not only my students, but my amazing family. I am grateful they understand why I feel compelled to go to these conferences and not only tell me to go, but encourage it. That also makes coming home all the sweeter. Spending time together this week over Thanksgiving break is a blessing I don't take lightly. My boys are growing far too fast, Chris and I try to step back and simply enjoy it on a regular basis. Hoping you all had a wonderful week! I've written before about my love of quick writes. I often share picture books, poems, images, and short articles and ask my students to write for two minutes in response. Occasionally I share a longer text or even a video. Today was one of those days. Last year I first heard of Kyle Maynard. One of my boys' coaches mentioned him as an inspiration. I immediately went home and Googled Kyle, stumbling across this video. I used it last year to talk about the idea of no excuses. I had forgotten about the video until this week. There are multiple reasons that it came to mind again. Adults that seem to have an excuse for everything, but a lack of desire to take any real responsibility. Kids that do the same. We are the role models for these children, always. I told the students to settle in, the video was long, and we began. Each class let out an audible gasp when they realized what Kyle was up against just a short bit into each video. They were focused, wanting to soak in his story. We all cheered when he finally fulfills his goal at the end. And then we talked. Kids realized why I had shared this video with them. They know, they know more than adults do. I gestured to Kyle and then back at them. We talked about how things aren't fair, but you can sit around and complain about that or get up and do something. I choose the latter. I think there is a real danger in complaining about everything. A danger in thinking life will be easy. A danger in believing your happiness in life is contingent upon everything being great. A danger in making excuse after excuse for your actions. I see this with adults. I wonder if they didn't have someone to teach them those lessons, and so I teach my students. I love these kids more than I can express. I was beyond grateful to have these honest conversations with them this morning. Now to put our conversations into practice. And, to lighten the mood, the conversation in my homeroom this afternoon centered around farting. Yep, you read that right, farting. Did you know that it still has an odor if you don't hear it? This was news to some of my kids. I tried hard to keep a straight face as we learned this news together. Sharing Last Stop on Market Street with my three classrooms. Having them notice so many little details that I had simply missed my first time through. Having reading conferences about book blurbs. Helping a few students craft them. Attending our Veterans Day assembly. Each year I get choked up. Watching the honor guard present the colors - men I grew up knowing in our town. Seeing all of the Veterans sitting with their families in the middle of our gym. Listening to each elementary sing a song they had prepared. Hearing a veteran from our town, the father of one of my former students, give an eloquent speech that included naming the 88 active members of the military from our town. So many students were named. I thought of each one and their ten year old face was what I remembered. How I love those kids. I rushed to Champaign for an appointment. After I was done, I headed across town to the bookstore. I had a mental list from my students. We simply "must" have more copies of Diary of a Wimpy Kid Old School. It was ridiculous I only bought one. What was I thinking? And I had a request to buy at least three copies of Phil Bildner's A Whole New Ballgame. Finally, a student wanted A Pirate's Code after seeing it blurbed on Kate Messner's blog. Why not, I thought. I rushed to the back of the store, I needed to be headed home already. I waved to one family from my town and circled around to the back. Grabbing two copies of Old School, I looked for the Pirate books. Found them both. Then I saw one copy of A Whole New Ballgame. Bummer. The kids will just have to deal with it, I thought. Then I went to the other shelf thinking maybe there were more shelved there. To my happy surprise, there stood one of my students with her family. As we greeted each other, she held up a copy of A Whole New Ballgame. Her mom told me that she had begged to come just to buy that book. I grinned. I have been reminded again and again this week that life is short. I lament often how busy I am, how little I get done compared to how much I want to accomplish. But really, today showed me what I really need to focus on. Students who are growing in their awareness of how they treat others. Kids that are finding new appreciation for picture books. Students who beg their families to make trips to the bookstore (and amazing mom's who take them!). And former students who amaze me with their dedication, choosing to serve and protect our country. My whole day was a high point today. I am beyond grateful to be just exactly where I am. Day made even better by Starbucks at the end. Have you seen Jessica's post yet today? If not, head over to her blog and read it. It's important. I think she captured what so many of us struggle with on a regular basis. One of my favorite quotes in the world is from Penny Kittle. It hangs on the wall in my classroom, just to the right of my whiteboard, to remind me. I believe you've got to do what's right, every single day of your life, even if the rest of the crowd isn't. Teaching is about honor and goodness and mercy. It really is. And no one will be watching you most of the time. You either live up to the calling of this profession or you don't, and most likely no one will ever know but you. Here's the thing I think Jess rubbed up against, and we all do from time to time. She holds herself to the highest standards. If we didn't care, if teaching was just "a job", it wouldn't matter. You wouldn't disappear to that dark place. As Penny says, most of the time we are the only ones who know how it is really going in our classroom. To everyone else, it looks fine, better than fine, really. But we know. And that is SO HARD. There is no way to be perfect 100% of the time. There is no way to always reach every child, every day. I wish there were. There are times I feel like a complete failure when parents tell me there children still don't "love" to read, but like me, so they do. How have I not reached them? How have I not shown them the magic that reading (and writing) can bring? It is easy to see our failures. That's when, I believe you have to look for the bright spots. You know they are there. It's just easier to see the rest. This week was crap in many ways. Some friends let me down. I had moments where I felt like a bad mom. I had a glimpse of every way I hadn't reached a child. And then Thursday hit. I tried to write. I tried to make my NaNoWriMo piece anything but the steaming pile I felt it was. I looked it over at the end of the day and felt misery. Who was I to think I was a writer? What did I really have to say? I reached out to some friends, crickets. Ugh. So Friday, I went to school. I spoke to my homeroom that morning. They asked how my writing was going. My eyes teared up, which frustrated me. Any emotion comes on and the waterworks are quick to respond. I told them that I felt it was bad, really bad. They asked me some questions about it, helped me see a thread that was dangling, just waiting. Too soon, we had to switch so they could go to math. A boy came over as he was headed out of the room and patted my back. He said, "I thought mine was bad too. Thanks for telling me you had the same thought." Our jobs are tough. It's easy to feel lonely in them at times. And when you are pouring your heart into something, that heart is open to be crushed. I think it's important to look around our buildings, see others in need of that reassurance. And when we are feeling like we've let ourselves down, I think it's important that we are honest with our kids. They tend to be ridiculously truthful, but also the best possible version of what we should be. Kids know when you truly care, when you are there for them, when you have tried your hardest. That's what's important, well, and getting back up and trying again. Thanks to Jess for that reminder. And thanks to my students for being there for me, once again. What a blessing it is to be in this profession. Thanks to Ruth Ayres for the weekly reminder to slow down and celebrate. Check out her blog for more celebrations. November. I greet it with both open arms, excited to see one of my favorite months, and an incredulous look. How can it already be November? I would love for time to slow down so I can appreciate each moment just a bit more, but I realize that I'm wishing for the impossible. Luke's basketball season began this week with a tournament. Three games in four days. I've watched these boys play together since fifth grade. Heck, many of them were in my fifth grade class. I know these kids. I cannot describe how proud I was to see them begin to grow, to play like a team. I cannot wait to watch the rest of the season with this group. What a great start. Liam's path to reading was not easy, but it is something he loves now. Last night he was close to the end of Kate Messner's upcoming book (out next spring/summer) called The Seventh Wish. I read it and loved it. I told both of my boys I wanted them to read it so we could discuss it, then I'd take it into my classroom. Kate does a beautiful job detailing what addiction can do to a person, to a family, in this book. I needed them to read it. I can't miss a chance to have that discussion as many times as possible. It was late last night when Liam came up for bed, but he begged to read. Just one chapter. Then he looked up. He had one chapter left. It was 10:40, later than he ever stays up. Please, mom. I have to finish. What else can you say but yes? It's hot chocolate season again. Nothing more needs to be said except that this makes me so happy. I don't think I've cried in front of my class yet this year. There have been some moments I thought the tears were coming, but they didn't escape. Until reading Finding Winnie. Something about that book. Man! Each of my three classes. Each time a tear or two snuck out. I just love sharing books with my crew. 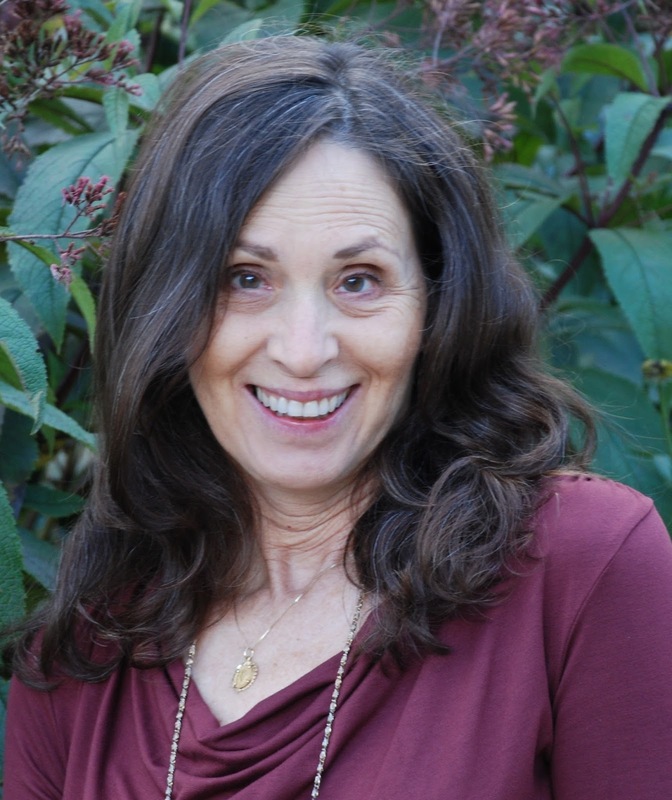 We were blessed (thanks to our district, school, and PTO) to have author Marianne Malone visit our class three times in the past two weeks. My students are inspired to try new things in their writing. I cannot wait to see what happens with their NaNoWriMo pieces. What fun! When Marianne spent time with my students for the past week, she talked about the benefits of living your life in awe. Of finding joy in the small things. I realized that is one thing I do well. Whether it is Chris helping Luke with his tie Friday morning, the way the fog rolls across the ground as I have a morning walk, or the beauty of the geese beginning to their journey south, I live in awe on a daily basis. What an amazing place this is. Every 2-3 weeks I collect my students' journals. They have an assignment each night to write for ten minutes. I really don't care that they do, but long ago I figured out that they wouldn't do things when they don't see a value for them. Eventually they will write because they want to write, the desire will be there, but for now, I check them. I don't read each entry, many are private, I just ask them to stick a sticky note on one entry from the previous 2-3 weeks that they want me to see. On the note they need to tell me why they've selected this entry. I absolutely love what I end up discovering. So amazing. Ugh. My writing is not going great. I'm writing along with my students this November, but I'm trying my hand at non-fiction. I said to myself that this is not a book. This doesn't have to be a book. This will never be a book. But of course I've put that pressure on myself anyway. And at first, it was great. Rocked. Flowing along for two to three days and loving it. Then day four hit. And I read it over and thought, this is crap. What makes me think I can write? What makes me think that this would benefit anyone? So, I shared that feeling with my students. I saw heads nod. Some of them are there too. And we talked about it. We decided we have to move forwards because stopping is not an option we are choosing. I have no idea what this will become. Right now it looks like great material for the trash can. But I will write. I woke this morning and dressed to take Rosie for a walk, as I always do. As we started out, kicking the leaves out of the path as we went, I recognized the feeling sitting on my chest. Sadness. I paused, trying to figure it out, trying to piece together why that feeling would be so heavy. I haven't lost anyone, nothing horrible has happened of late, there is no reason for it, until I realized there was. I would consider myself a pretty optimistic person. I believe the best in people, to a fault, until the prove me wrong. (Or, hopefully, they don't.) I keep thinking there is more good than evil in this world. And, for the most part, I am proven right, again and again. I think what you put out there comes back to you. This week I have let the negatives of social media consume me. I've watched people in the beautiful world of children's literature "shout" negatives at others. There is a book at the center of it, one that some feel shouldn't have been made. The reason it is being targeted is for the way it portrays slavery. Here's the thing, I strongly believe we need to talk about race and discrimination. I believe we are still fighting prejudice, sexism, and homophobia in this country. We need to be having hard conversations about our biases. Social media, unfortunately doesn't seem to be the place for it. People begin to feel powerful when others retweet, others agree. They begin pushing forward what they believe, but not listening to anyone else - unless you are patting them on the back. It makes me sad. The keyboard, computer, phone, etc puts a wall between us. We are typing away, not thinking of it as a discussion anymore. I don't know what the answer is. I love discussion. I love talking, trying to figure out why I feel a certain way. It is uncomfortable at times, but I grow when I look and push myself to confront my biases, ones I didn't realize I had. Shouting matches on social media don't help me to do that. They make me uncomfortable. They made me withdraw. They make me wonder how we will ever come together. So for now I stay silent, like so many others online. I read and my heart sinks. I wonder why people feel the need to tear others down just to prove their point. I wonder how this could be different, how we could find a way to sit down and talk about it, how I can possibly handle staying online when it hurts me to read it. And I will continue to push my thinking with conversations in person because, apparently, that's the only way we can have them. 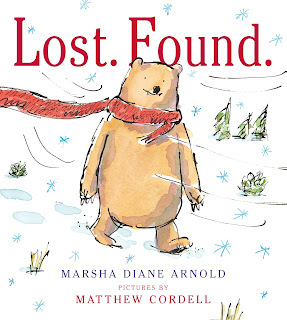 When I first read the picture book Lost and Found by Marsha Diane Arnold, I fell in love. With so few words a beautiful story is crafted. My fifth graders loved seeing what came next as we moved through the story together. I'm delighted to welcome Marsha to my blog today to tell you a bit more about this story and what she is working on next. I love Lost and Found because the story is not only in the text, but in the illustrations. How did you and Matthew work together to tell this story? I wrote the Lost. Found. manuscript, which consisted of just two words repeated over and over, along with art notes. The art notes for Lost. Found. were a bit like directions in a script. Matthew took my art notes and, through brilliance and imagination, brought my characters to life. We really didn’t talk about the book while he was working on the illustrations. I’m so impressed with how Matthew kept my story intact, but added things that heightened the meaning and the fun. He added onomatopoeia to highlight the animals’ actions. For example, “Zoing, toing, doing” is the sound made when the mice use the scarf as a trampoline. He also made some of the animals more mischievous in his illustrations than I had them in my notes. In my original art note I wrote, “Raccoons begin playful snowball fight.” Matthew escalated that play, making the raccoons more rascally than I’d imagined them. This heightens the fun and increases the tension. Thank you, Matthew! What does your writing life look like? My writing life has been quite messy this past year as my husband and I moved from California to Florida. We actually changed living places eight times over the year as we waited for our new home to be completed! My Florida writing room is currently filled with boxes from our recent move, but once all the books and notebooks are put away, I’ll enjoy writing in a wonderful space. My books in California were spread throughout two rooms and a hallway. Here in Florida, I have shelves along one entire wall, so all my books will be with me in my writing room. I love being surrounded by books when I write. Although I think it’s an excellent practice, I don’t usually work on my stories every day. But when I’m excited about a story, I’ll write several hours each day because I’m so happy to be with my characters. The more we write, the more we learn about writing. Even 10 minutes a day will keep us on track with our writing projects. Do you get ideas from every day life? How do you capture them? Absolutely, I get ideas from every day life! Ideas are all around us. But capturing them to weave into stories is always a challenge. I might see or hear something, then scribble a few words in my notebook. I might carry that idea in my head for days or months until another thought comes to me and another. Eventually, all the ideas tell me to sit down and start writing. So I do! Writing books requires lots of research, even if it’s a short picture book or board book. Research is one way to help “capture” our ideas and it’s part of the fun. We get to learn so much! I have two board books coming out in 2017, one about napping animals and one about bathing animals. I probably did over 100 hours of research to verify the napping and bathing habits of baby animals, but what I learned was fascinating. The hardest part about writing for me is to believe in myself. I often stop writing because I have doubts about my being able to write the story the way I want it to be. If any writer has similar doubts, I say, “Don’t listen to your doubts!” We just need to take our ideas and enjoy the process of writing our story. I have four more books coming out between now and 2017. Very exciting! These require attention along with my writing of new stories. For my new stories, these characters are wandering around in my mind: a wombat who loves words, an out-of-control letter Z, and a firefly who can’t find the dark. After I finish unpacking boxes, I look forward to getting back in touch with these characters and learning more about them. Thank you so much for inviting me to be part of READ. WRITE. REFLECT. It’s been a delight. Thank you, Marsha! It was great getting to know more about you. 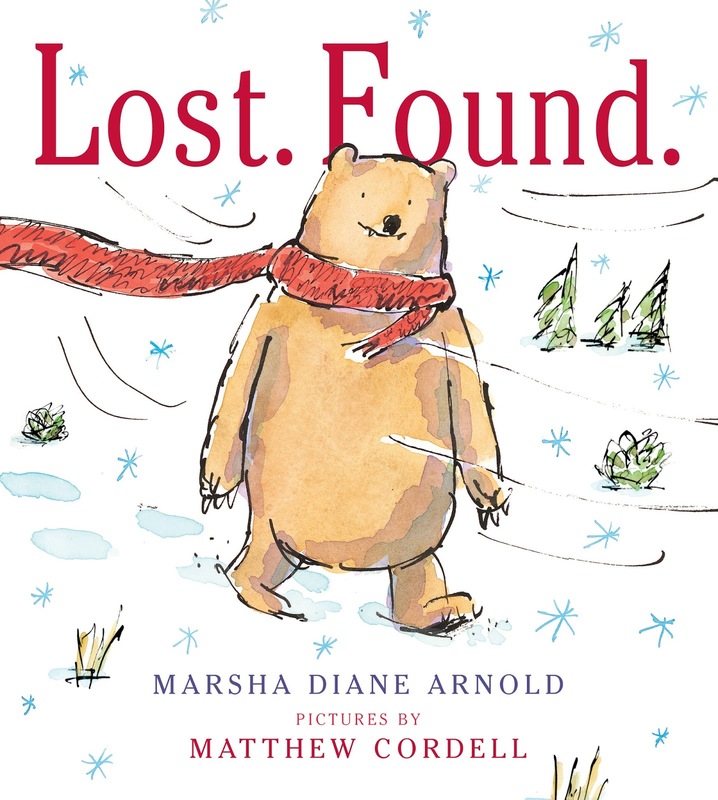 If you would like to learn more about Marsha and Lost and Found, please check out the other stops on the Blog Tour. November 5: Read. Write. Reflect. It's Monday! (A Day Late) What Are You Reading? Sorry to post my weekly reading late, my internet at our house has been just complete crap of late. Coincidentally, my students are posting their weekly reading to our Padlet a day late too. 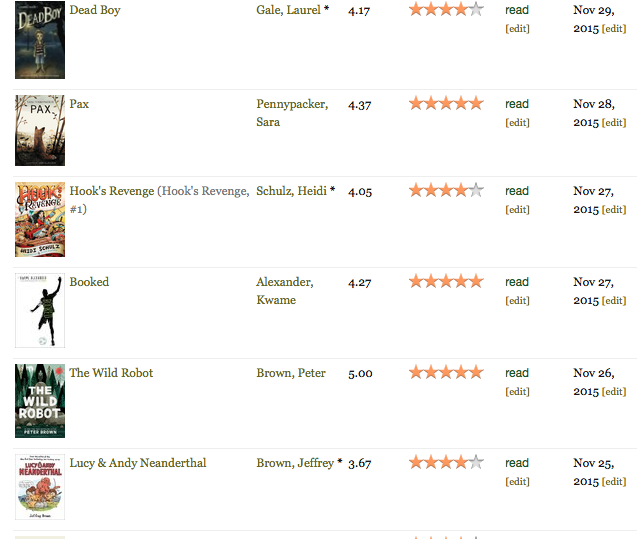 At any rate, I read some fabulous books last week and wanted to share. 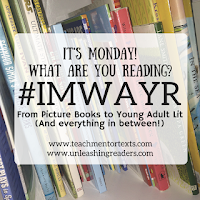 As I am running late for school, I can't break down what I thought of every book this week. They were amazing! What I do want to mention are the three professional development (PD) books I read this week. Three! Sunday night's #titletalk Twitter Chat talked about reading plans and gaps. PD books are ones I love to read, and love to buy, but I don't always get around to reading them as fast as I purchase. My advice to you is this. Tell your students to hold you accountable to a reading plan (or this would work with any plan, really.) I told them I wanted to read ten PD books by the time I head to NCTE mid-November. They ask me every day (and nightly on Instagram) where I am in my reading plan. Absolutely helping to keep me accountable!